Remember the old days when someone would send you a text message with a phone number, and you’d either have to memorize it while you dialed or even worse, get a pen and write it down, just to add it to a new contact immediately after? Those days are long gone, and even better with the iPhone you can actually create a new contact directly from any phone number that is sent to you via text message. This works in iOS on iPad and iPod touch too but chances are you’ll get the most use out of it on the iPhone. 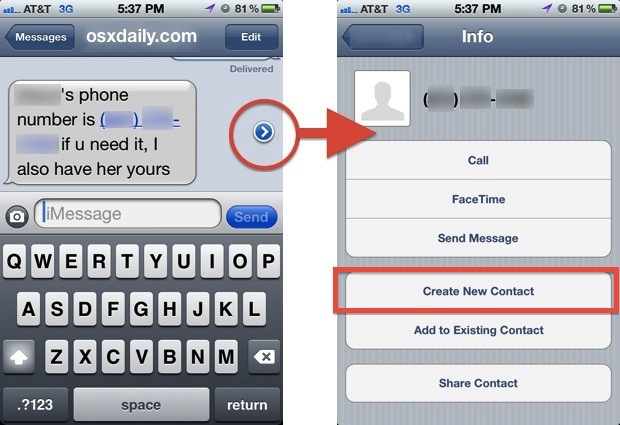 If you’re on the other side sending a phone number out, remember that you can directly send contacts from the iPhone through iMessage and email that contain a full address book listing for a person, including their number, name, email address, picture, and whatever other information you have stored in the vcard file. I sent a text message to a phone number, using my iPhone 7, and can’t figure out how to save that phone number is my contacts. Help!